Congestion in central London has returned to pre-charge levels, London Assembly Conservatives have claimed. Motorists experience about 2.27 minutes of delays per kilometre, according to Transport for London's (TfL) figures. Conservative Angie Bray said the scheme should be scrapped as drivers were being charged £8 while congestion had barely improved since 2003. TfL said traffic in the original charge zone had dropped by 21% and without it "London would have ground to a halt." Congestion levels are measured by comparing traffic flow during the daytime with the night time, when roads are clear. Before charging was introduced in 2003, drivers experienced 2.3 minutes of delays per kilometre, according to TfL's surface advisory panel. The average delay for the last six bi-monthly surveys has been 2.27 minutes of delays per kilometre. A TfL spokesman blamed the current congestion levels on a "near doubling of street works reducing road space". What's the point of paying £8 for something you used to get for free? "Angie Bray's suggestion that any resulting increase in congestion would be solved by abolishing the congestion charge defies the basic rules of logic. "It would simply mean more traffic and worse congestion - it would make the situation worse." 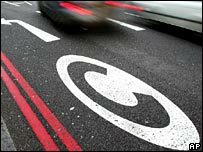 Ms Bray said the congestion charge zone, which was recently extended west, "had lost its main justification". "Congestion in central London is now virtually the same as it was before charging was introduced," she said. "It's no use blaming this on an increase in roadworks, the mayor's own figures show that in 2006, for the first time, the number of cars entering the zone increased from the previous year. "What's the point of paying £8 for something you used to get for free? "Surely now is the time to start thinking of an alternative way to tackle congestion."